Photo courtesy of the UNC School of Medicine. 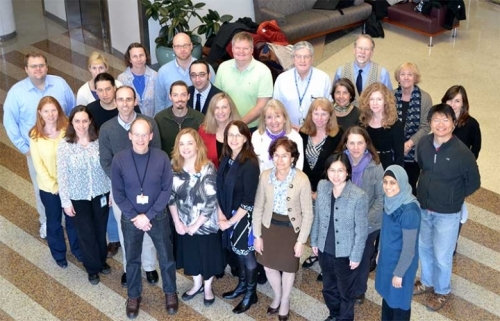 A group photo of the researchers behind the NCGENES project. Among scribbling pencils and stark concentration, one child with sweaty palms and bouncing legs falls behind. The child’s teacher and parents notice her behavior — hyperactivity, below-average intelligence, social conflict — and discuss having her tested for intellectual disability. But what if nothing shows up? It is not guaranteed that the little girl’s family physician will be able to identify her intellectual disability. For instance, physicians are unable to diagnose a child with mental retardation 30 to 50 percent of the time, according to the American Academy of Family Physicians. This commonality is not specific to the disease. This is where the North Carolina Clinical Genomic Evaluation by NextGen Exome Sequencing (NCGENES) comes in. NCGENES aims to create best practices for genomic technology in the clinical setting. To do so, the project has involved more than 100 researchers studying everything from the protection of data to the delivery of results. Each year, thousands of patients undergo costly, extensive testing to explain medical conditions and these inquiries do not always receive answers. In 2011, the National Institute of Health reported over 200,000 undiagnosable people across the United States. Genomic sequencing — a test that connects the dots between genes and current or potential diseases — is often recommended for undiagnosable patients. In the past, genomic sequencing cost about $1,000, but a new technology called whole exome sequencing has cut that price tag in half. With only two tablespoons of blood, whole exome sequencing tests 1 percent of the genome. DNA is copied, sequenced, and read from the blood to unlock medical answers. While this test helps solve medical mysteries for patients across the nation, it also creates a wave of ethical questions. “The project kind of qualifies as big science if you think about many different people with distinct areas of expertise coming together to carry off a project that no one of us could do alone,” Berg says. This diversity and variety of research allows for the project to answer questions across the board. In 2009, NCGENES began with a grant from the NIH. Since then, the project has garnered over 750 participants suspected to have genetic error-based disorders. With a recent grant extension to 2017, the team continues to study the ethical and psychosocial implications of sequencing and develop universal rules from patients’ cases. One of the practices the project strives to perfect is when sequencing should be administered. By forming guidelines, NCGENES hopes to prevent patients and insurance companies from paying for testing out of naive curiosity or poor guidance. Take into account the hypothetical child mentioned earlier. Based off of her symptoms, her parents and physician may decide to have her genome sequenced. With more than 25 percent of persons with mental retardation having detectable differences in their chromosomes, there is a decent chance sequencing would lead to a diagnosis. Like the girl, if a patient’s symptoms are serious and have previously been tested, answers may be found through sequencing. But if the symptoms are explainable or the patient has had no previous medical testing, sequencing serves less relevance. This margin of success leads to many different types of answers in sequencing. NCGENES classifies these as positive findings that explain the condition, possible findings that may explain the condition, or negative findings with no explanation of the condition. Another concern NCGENES researches is the complexity of sequencing results. Frank Porter Graham Senior Scientist Debra Skinner and Postdoc Kelly Raspberry follow what happens after results are delivered. They focus on communication between doctors and patients and the effect results have on patients’ lives. Evans says two questions are always asked when results are reported: Did the patients learn something that explains his or her medical condition? And, was a genetic condition found that was unexpected? At times, patients do not find answers to their medical conditions. Instead, they receive incidental results, or unexpected information from the testing. This information raises ethical questions based on relevance as it can lead patients further away from the initial answers they sought out. Berg explained in the case of the little girl, the test could be administered because of an expected intellectual disability. The results, however, could find no indication of intellectual deficiency and, instead, a predisposition to cancer. But sometimes incidental findings provide solutions for problems patients were not even aware of. “Anywhere from 1 to 5 percent of people who have this test done will have a genetic finding, unrelated to their diagnosis, that would cause their physician to recommend some type of change in management,” Berg says. Jonathan Berg and James Evans both serve as principal investigators under the NCGENES project, which is carried out in the Berg Lab on the UNC-Chapel Hill campus. Berg also serves as an assistant professor at UNC-Chapel Hill’s Department of Genetics. Both Debra Skinner and Kelly Raspberry serve on the Behavioral or ELSI Staff for the NCGENES Project specializing in qualitative data. Skinner is also an adjunct professor in the Department of Anthropology at UNC-Chapel Hill. The NIH grant for the NCGENES project is estimated to be about $6.4 million.